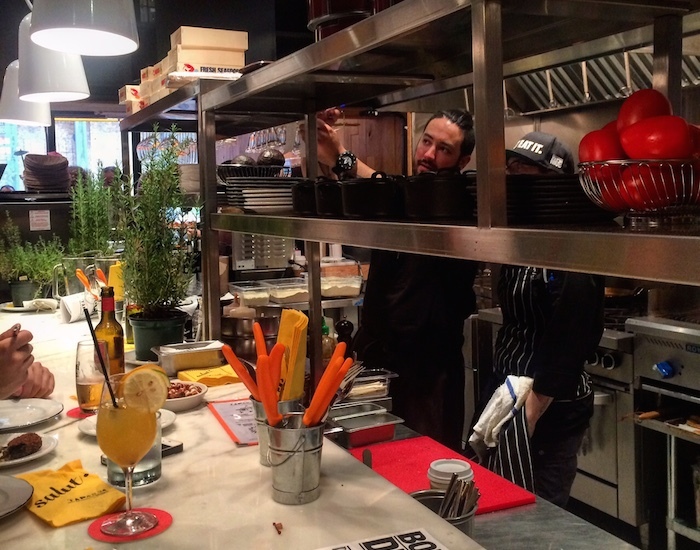 Sitting adjacent to Tapas 24 on Notre Dame is the newest addition to the MTL Cuisine family, Tapas 24 Snack Bar. Opened officially to the public last week, they enjoyed a soft launch over the weekend featuring a couple of nights of friends and family specials, free ice cream and weekend brunch. We stopped by for a preview last Friday night and here’s what we took away. First of all the food was great. Much like it’s big sister, Tapas 24 Snack Bar serves up tapas, pintxos and bites to share albeit in a more relaxed and laid-back environment. Heavily inspired by the cuisine of Barcelona, we were served a selection of the vast menu’s highlights, all of which were delightfully presented to us by the kitchen staff from the other side of the counter. We kicked things off with a couple of Iberian ham croquettes from the “Tapitas de Bar” menu which were piping hot and filled with a creamy ham-based sauce. 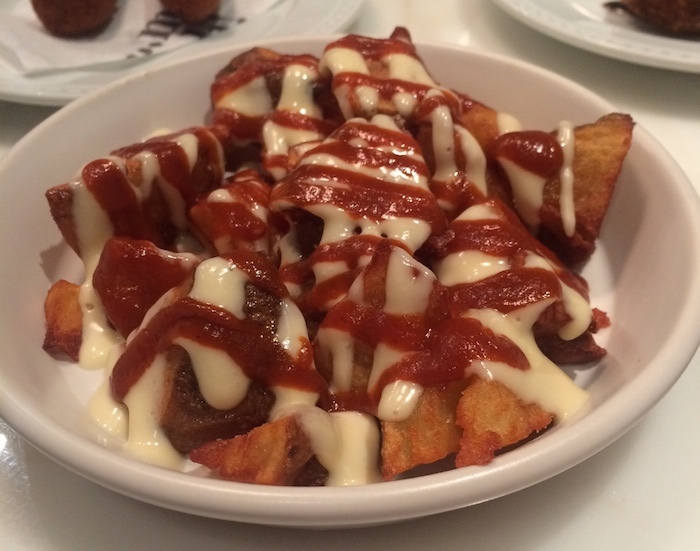 From the same menu we were also served papas bravas (potatoes; pictured below) which were lightly fried and drizzled with aioli and brava sauce. This was quite tasty and perfect for those who like their food a little less spicy. The same goes for the starter, a coca bread with tomato and olive oil. The last item that we tried from this menu was the costillas de conejo (marinated rack of rabbit). The dish was lightly coated in batter and fried and was served with a delicious aioli. The dishes came out across the counter at a break-neck pace, faster than we could finish what already lay before us. This made my dining partner very happy! I’m sure she put some food in her purse for later. She’s done it before and she will do it again. Next up we tried an ox tail croquette which (when you get past the thought of ox tail was very good) had a crispy texture on the outside while inside, the meat was tender and the gravy was savoury. The menu also features mini fish cakes made with salted fish. For those who like this sort of thing (I’m not a fan of salted fish), it’s well made, crisp on the outside with a refined texture inside the cake. In true Montreal form, a couple of menu items feature a collaboration with one of our city’s most iconic restaurant brands, Schwartz’s smoked meat. We tried one of these dishes, a bowl of salted french fried potatoes with Schwartz’s smoked meat mixed in and topped with a lightly fried egg. The dish is perfect for sharing and I’m sure will be a 5a7 favorite. Everything in the bowl is tailor-made to go with a cold beer. It’s simple but does the trick. One of the best dishes of the evening (and the one I’d most recommend) was the fricando classico (braised beef cheek; image above). 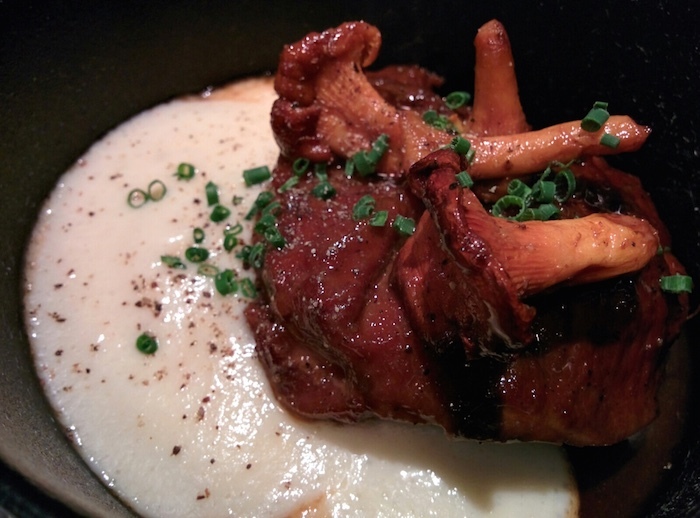 The meat was perfectly braised and so tender, it fell apart with the slightest touch of a fork. It was served on a bed of moussed potatoes with seasonal mushrooms and a savoury gravy. The dish I had a little trouble with was the calamari sandwich. Less than the sum of its parts, it probably looked good on paper but it was awkward to eat. The calamari itself was wonderfully crisp, the bread was soaked in a aioli and sriratcha, giving it a sturdy kick. Independently these elements worked fine so when I order it next time take it apart and eat it seperately. We ended the meal with a couple of crispy currros, fried and coated in orange sugar and drizzled with dulce de leche. A classic Spanish dessert, they were a sweet way to bring an excellent introduction to Tapas 24 Snackbar to a close. The atmosphere at the Snack Bar is wonderful with a few tables and spaces set up around the circumference of the space to squeeze in as many people as they can. It’s smaller spaces like this that have people lined up out the door in some of the busiest restaurants around the city. It doesn’t have to be VIP to become coveted. This coziness will no doubt add to the convivial atmosphere. The elements are all very modern with the kitchen taking up a fair amount of space. A spot at the counter in front of the kitchen is a great vantage point to people watch and have a chat with the great crowd in the kitchen. Tapas 24 Snack Bar isn’t just a great addition to the original Tapas 24, it’s going to be a fantastic place to stop and have a quick lunch, a relaxed 5a7 or even just a few bites and a beer before getting your night started. You can also get your food packed up and take to go and with it, a wine of your choosing as well. We’re sold! For more on Tapas 24 Snack Bar, visit their website here.